It is a New Year. Usually I don’t have New Year’s Resolutions (as you will see from the photos below), my life is just lived a bit more haphazardly. Remember that girl up there in my header is me—skipping along, stuff falling out of the wagon and while I never want to let go of the shear bliss of creating, it is time to let in some organization. I would love to open this up for a group project as I am always willing to receive help and take advice. However, I remember not too long ago when I asked for your best organizational tips many of you seemed as befuddled as me (hehe). I will put it out there again. What should I do? How do you do it? I will post a new photo of my room the 1st day of each month this year. Hopefully this will document the progress I have made! Any companies out there that want to take me on as their personal project—don’t hesitate to apply! Turn away now if you are squeamish! I have started reading Getting Things Done: The Art of Stress-Free Productivity . I would love to implement his system. I do wonder what he would do with all of the #6 plastic containers waiting patiently to be made into Shrinky Dinks? You can take a little quiz to test your Getting It Done IQ at his website. I realize by posting these photos Martha will never want to be my BFF! I do feel the need to explain the photos (my husband even said he was embarrassed for me)—-it takes so much stuff to do all the projects here at Skip to my Lou, the room is too small, I don’t have money to buy more organizational aides(and obviously don’t know how to use what I do have), I have three kids, I am so busy, on and on………but really! You mean that I am not the only one who has rooms like this?! I am on a cleaning, organizing, declutter mission, too! When I was in college I had a very creative roommate, in fact she was an arts major!, and her part of the room was a chaos....piles of clothes on the bed during the day, piles of clothes on the floor at night...under the bed grew all you could think of...of course we, other people on the house, thought and commented how could she live like that??!!! blah, blah. blah... anywho... now that I am at my more leisure self and can actually devote time to my creative juices...am almost at that point.... I just don't want to spend time doing chores...there are so many other important things to do!!! and so is the matter with my tiny craft room!!! It is a matter of priority for us who like to create...that comes first... and we should just own it!!! of course some organization ever so often is always due!!! Just came across this old article... I was wondering if you found a solution? Have you took an updated picture?? i have to laugh!!! my daughter and i started our business 2 years ago. she is 21 and the oldest of 9.she was living in an apartment next door.well she , her husband, and my 2 yr. old granddaughter moved home a year ago.so now there are twelve of us in my house.as hard as i try to be organized it seems like i am the only one trying!!! lol.my craft room is my haven,so i have a nice two door cabinet to keep my fabric in,on the outer door ,i bought closet organizers and put all my ribbon in it.three drawer organizers are the best though because they are all stackable and come in all sizes all i can say is one thing a day at a time and good luck!!! What a wonderful thing to open this today and see it for the first time! I've spent the past 6 months organizing my basement craft area. I began by taking everything OUT, and starting with a blank slate. I went quick. I made 3 piles, Definately Want, Definately Don't and Maybe. I hid the Maybes inside a box. Having to decide right then bogged me down, so I did them last. I also took everything out of the store packaging. My storage consists of rolling plastic caddies, bookshelves, and a 5ft. long set of old kitchen cabinets that sit on the floor. I have baskets, and clear shoeboxes. I got some stickie mail labels (Leftovers from work) and labeled everything. I let go of all round continers because they waste space. I realized I had too much in one place. So, less-frequently used items such as iron, sewing machine, toaster oven, large paints, rolls of wallpaperr, fabrics and foam core are in a different section of the basement. My area now has the Immediate Gratification things in it. I also did not let myself put up a second craft table. Since the first one gets covered, the second one would, too. I think you're great, never mind Martha. Anyone who puts tissue paper in all her sweaters before she folds them and puts them in her drawer is not someone I'm interested in. I don't have the luxury of time to do that and I don't have the money she has. I saw a tee shirt that says 'Martha doesn't live here' and I think we should all wear one. Martha is fine, for Martha, but we can't all be Martha (thank heaven, that's a good thing). I bought a number of clear plastic boxes with plastic lids and a pack of lined library cards. I divided my hobby items (multitudinous) into categories and put them in the boxes and wrote on the cards what was in the boxes. I taped a card to the front of each box. I can see through the boxes as well as reading the cards. I'm often not great about keeping up with my boxes, but things are much better since I started that. Of course, I have some hobbies that don't fit into boxes and that's a whole different story. I'm still working on that. The bottom line is that life is short and not always beautiful. You have to have some fun and enjoyment. When you are a creative person, you need to express that. The people who have responded to you here love what you do and it's great that you share your passion for making things with everyone. You've spread some joy and happiness around to other people and there's a lot to be said for that. In 50 years from now, no one will remember what your craft room looked like. If they do, they are more likely to remember the wonderful things that came out of it and smile. I've enjoyed your site immensely. Thank you. You know, I can relate to you`r stress-related cleaning. One thing that helped me was thinking 1: Do I NEED it? 2: do I collect one pretty thing, or many pretty things? 3: I need more space 4: Who can I give things away to as an gift or to get ridd of some things? I don`t like to toss away stuff, and are a fan of recykling. but it is good to see that you managed to organise the stuff into order. Isn`t it fun to go in there now? Sorry if the english is a bit off, I`m norwegian. So I just wanted to give a little support and understanding. Happy crafting, Heidel. Thanks for the comment on 30days and Tip Junkie. I love this post of yours- why do you think I did that organizational post? Um because I am the one who needs help. I bet I could at least match these pictures if not outdo them....I am working on my craft space right now. But I'm not brave enough to show the pictures. That's why I love that book I found. well, one day...some of my kids will be moving to college. then i can take over their rooms!! I'm so happy that I'm not the only one who has a secret craft room. It was disasterous after chrismtas projects. So I've started the process as well. I've posted in my blog as well the before and after pics. Good Luck! I have a little embroidery shop, and boy does that craft stuff get unorganized quickly! We have recently organized the fabrics into color order in clear plastic drawers, it's helped a little. Still, it's a major daily battle. I just try to stay focused on my craft and when I'm stuck - I clean up. This is probably not the advice you were looking for. But, I happen to stumble onto your site and it's really nice! I'm having fun looking around. When I saw the pictures of your craft space, I felt right at home. just emailed you a fwd from better homes and gardens- all about organizing a creative space! lol... came in with good timing. Boy, good luck. I empathize. Creative people are messy. Period. I do agree that streamlining would probably be more productive. I am going to use all the advice you have gotten. Good luck, cant wait to see "after" pics! Thank you so much. It makes me feel a bit better that I'm not the only one that needs some help (and time) to get things organized .... and then somehow KEEP it all organized. Every time I think (operative word THINK) things are looking good/organized - someone decides that we NEED something else and brings it home, decides its NOT QUITE right and changes things without saying anything, or the like. I think I'm going to start smacking fingers/hands that try to "help" when I don't want it or ADD to the mess with things that they "need" but don't have a place to put it. Oh, for my spools of ribbons - I took one of the pants hangers that we got from the drycleaners and put it in the closet. With a little tug, the metal part separates from the cardboard part so I can slip my ribbons on and off easily and they're contained in the closet. I also have several fabric closet organizers that I need to take up there. Oh, I love you! Thank you for posting; it makes me feel better. We moved into our home a year ago this month (Wow! ), and all of my craft and sewing stuff is sharing a room with a computer that doesn't work, our eliptical trainer, boxes of stuff that my MIL insisted we take from her closets (my hubby's childhood memories stuff) plus furniture that we weren't sure quite where to put. So, yesterday I decided to claim the space. I cleaned off two shelves on the bookshelf and added my paper. I put the old computer in the closet and took back my craft table. I brought over an old chest of drawers and made it a printer stand and stashed a bunch of my supplies in the drawers. I even added a small power strip to the tabletop so I can plug in my glue gun, sewing machine, etc. I was so excited! Last night, I actually went up there and started on my Valentines cards. There's so much more to be done, but the biggest challenge is getting started. I think this is pretty normal--mine looked like that b4 it got turned back into a kids' room again. i keep saying that i'm one of those people who thrive on disarray, but its so a lie. so on that GTD-IQ test, I am a 1!! I am SO a Responder/Victim. Well, now that I have been analyzed so thoroughly I'm off to drag children out of bed for the day. I could scare your pants off if you looked at my craft room! I try to keep organized but it gets out of hand because I do more than one craft at a time, and the next thing you know they are all laying out all over. As for the shrinky dink containers... if you cut the rippled sides that aren't used off, the flat tops and bottoms can be stacked. That at least looks neater and leaves room for MORE pieces! I like to color coordinate my fabrics, that way it's easy to see what I have and well, it's just darn pretty to look at. I also bought some accordian filing systems - they're inexpensive and hold lots of those little pattern pieces, templets, graph paper, patterns off the internet, etc. Those have been the best thing ever. Also I used to store my fabric in hanging shoe holders in the closet - inexpensive and not permanent. Good luck with your organization! I'm tackling my room too!! You are lucky... I don't even have a dedicated room for my sewing! I'm feeling a bit of sewing room envy right now. I love the color! I got myself a label maker, and I love it. Here are a few ideas... I see you have a lot of shelves. 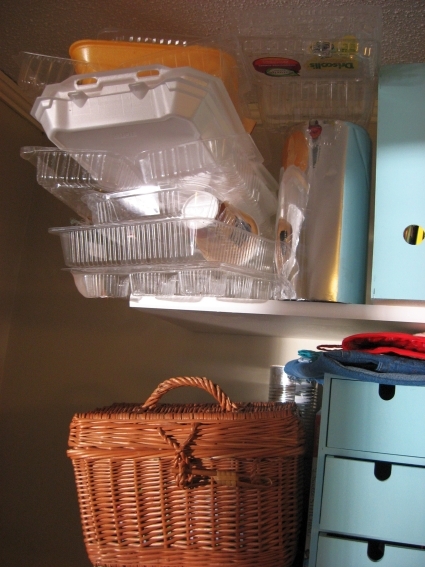 I would use clear stacking bins with lids, put like things in them, and label them. Also, in you closet you could add more shelving on the back wall to make it more U shaped. Have you tried over the door shoe and jewelry bag storage? They are great for smallish bits. I am a visual person, and I need to see what I have so I do not buy extra. Can you hang your thread and bobbin storage unit on the wall? You could add a lazy susan style art cart in between you sewing table and desk. If the top is fixed position, you could put you TV on top... bonus! Bags are not your friend. They wrinkle fabric, you can't see what's in them, and they get lost easily. I need to take my own advise, ha ha. Good luck! Ha! You are so much more organized than I am! I WISH I had shelving in the closet so I could actually find things. The only reason that RIGHT NOW my room is cleaner is because it is also the guest room and we just had guests. 1) Craft supplies are such odd shapes and sizes so it's hard to figure out what will organize them best, but still look nice. I like reusing food or paper containers but often these are ugly or don't allow you to see what's in there (especially for the little ones). I think it doesn't matter so much if you have doors or some other cover over your storage but for me I don't. 2) Do your mesh baskets work for you? I'd be more inclined for something closed so things wouldn't poke out the mesh holes...thinking plastic so that it could also slide off the shelves easier? Then, Grab a trash bag. If you're anything like me, you like to keep stuff, but you have to learn how to throw/give/recycle it away. Fill up one trash bag of stuff that you will get out of your house one way or another. 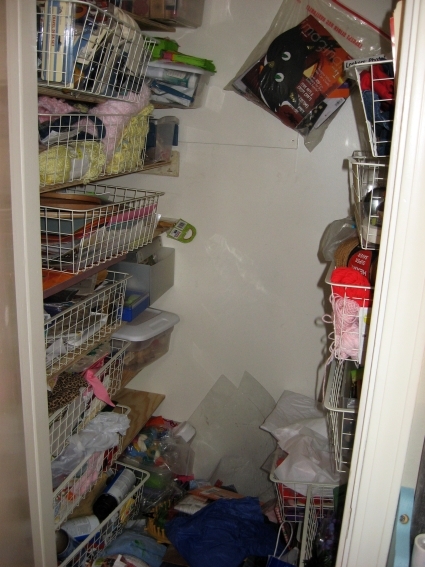 You have lots of organizational baskets/cabinets. Empty them all out and group stuff that belongs together, then start putting them all back away. The Key????? Only do TEN MINUTES at a time!!!!! Before you sit down to begin a Skip to My Lou project each day, FIRST clean/organize for just ten minutes. Time yourself. Then be done for that day. Trust me, even with the mess you make afterwards, you'll really start seeing a difference. Happy organizing! Thanks for keeping it real - I needed to see someone else like me. I too am a crafter - a homeschooling mom crafter at that - so our home is teeming with things my DH is itching to throw away. I'll be working alongside you to organize. This will be fun. one more great book..."Organizing your craft space" also by Jo Packham. More great pictures and ideas. Organization is my priority this year too. I love the idea of posting a photo a month. That really puts the pressure on to have some progress to report every single month-lol. I feel your pain. I just posted about my reorganization attempts yesterday. Oh my... Thank you for posting this! I think everyones craft area gets messy. What do I do about it?? I remember every thing has a place and every place has a thing. And I don't start another project until I clean up the last. Good luck!!! I want to thank you for the interesting, inspiring, and entertaining bits I've been reading here for the past few months. This site is on my daily blog check and I really love it. That said, I think if YOU want to have a less cluttered space then maybe you could make it your project to create a work of art out of the place where you create art. I think that you have demonstrated an ability to create amazing things, this could be a snap for you if YOU want to streamline things and beautify a space where you spend a bit of your time. That said, sometimes clutter stimulates creativity IMO... I think what you have been doing obviously works so really, with all the beauty coming out of the room does it really matter what the room itself looks like? About FlyLady: people seem to love her scheme or hate it. Just so you know ahead of time, in case you're one who doesn't love it. I have no advice but LOTS of sympathy because I'm in the EXACT same place. I odered the David Allen book. I wish us both luck! Oh thank goodness, I'm not the only one! I so know the pain of a messy craftroom! I finally (cross my fingers) have a place for everything so it's much easier to clean up when I'm done with a craft frenzy. :) I love flylady (especially her advice to set a timer). I also really love Julie Morgenstern's book, "Organizing from the Inside Out." I think I only read half the book before I could get to work and that part was a fast read. Definitely worth buying in my opinion, but the library has copies, too. Once I did a room or two using her system, FlyLady got much easier for me. Hth, and thanks so much for the great projects you've posted here! That book looks like a good start. I can't say much because my room looks worse than yours BUT I know that it can be done. I do have pockets of organization in my life. I have used the FLY Lady and the Slob Sisters and have had a lot of help from them. They understand the disorganized mind. They know how we think and how to work with it instead of telling us just to put things away they tell us how WE do it. :o) We aren't lazy just busy. I think I should take your challenge to take a picture of my craft room but and very chicken. It is frightening. This was an awesome post. Thanks for sharing! Its hard to be an organized creative person! I did it a couple years ago and it stays that way. I think it is amazing (and not my own idea). For patterns, I put them in comic book sleeves with the comic book backing. It keeps them stiff and neat and also archival safe! Oh thank goodness that I am not the only one. I don't have a craft room, though. Just the dining room which is smack dab in the middle of the house! The thought of unannounced company puts me in a panic. I think you have a lot of great components of organization. The thing you might want to do is organize on a monthly basis by getting rid of some things and rearranging the others. It helps you keep stock of what you have so you don't overbuy, donate what you wont' use and it can be inspirational! This way things don't get out of hand, either. I don't see a bulletin board - you may want to add that so you can organize your projects, or even a calendar. Finally, I've been thinking a lot about something I read in Mary Englebreit magazine that Amy Butler said. She said that she doesn't bring something into the house unless she absolutely loves it. Now that doesn't help with some craft necessities. However, it may very well help with people like me who keep adding to their fabric stash just because of a good deal, or vintage, or cute. Can't wait to see your transition! Check out the book "Where Women Create" by Jo Packham. The entire book is dedicated to showing off the studios of women artists. Perhaps you'll feel inspired by the darling photos! I just found your blog recently while searching for crafts to do with my children...thank you for the great ideas! I don't think I could ever give advise or make a sugestion I am in the process of giving my home and "enema" I got a 20 cubic yard dumpster and started in the attic and worked my way as far as the garage....dumpsters full so forget the basement....and what I didn't throw out I freecycled( love that freecycle and you can find a ton of craft stuff through it!!!!! If I come across any suggestions in the next few days I'll let you know...I have a g/f that is a professional organizer and she told me that if I gut the junk out of the house she would organize me for free!!!!! FREE every crafters favorite word!!! I love you for posting this. Thank you!! Then Contain everything. I would get some clear plastic shoe boxes (which you can get for about $1 at Walmart. Use those for Ribbon, paint, glitter, buttons.....and LABEL..
For fabric, I've done this with mine and it is so worth it--go to a comic book shop and buy a pack of boards...(they are relatively inexpensive...I think a pack of 100 is less than $10...Fold your fabric in thirds the long way and wrap around the boards..they all stay the same size and stack neatly. Put everything in those shelves...I bet it would all fit, once you organize it.. If you were in FL I would so come do your craft room..
Good luck. I LOVE your tutorials--keep up the good work. And every time I get rid of something in my craft room, I seem to bring 3 things in.... my room looks very much like yours! I'll tell you what,every room and nook and cranny is organized in my home except for my crafting area.I have cleaned it numerous times and by the end of a crafting day it looks like a cyclone has hit it.....again.I just tell people,a messy craft table reflects a creative mind lol. I use a file draw and folders to organize my fabrics. Can i Email you a picture. Also I use the cubby bookcase from Ikea to seperate each function and keep them in polkodot boxes. I an interested in the number 6 plastic for shrinking do you know of a good place for a tutorial? When my corner starts to look like yours I start sorting and pitching and organizing and like you I don't have a lot of money for new organizational equipment.I have a few ideas for you starting with the number 6 plastic. You could quickly cut out the sides that are not usable and just keep the flat pieces that would fit into a binder. Your room also seems to be a dumping ground for things that don't have a home like the tv on the floor. Is there any way to donate those items or find more useful homes for them? My children are often guilty of adding odds and ends to my craft space so I keep a small basket for collecting their stuff. When it is full I have the put their things away in their own space. I hope that some of this has helped. I feel your pain. I have one suggestion that can help with your clutter and won't cost a cent. Watch this video http://www.marilynbohn.com/media-center/organizing-fabric-tips.html by Marilyn Bohn and check out her other origanizational videos and tips on her site. I have one closet of fabrics folded as Marilyn suggests and it has made a big difference -- takes less space to store my fabric, is so easy to find what I want, and pleases my eyes and soul. Praise the Lord! My room isn't the only one in this condition!!! You're like the 4th person to post about that book... I might have to look into it. I have serious doubts that us creative types will ever truely be organized though... Happy New Year! I just remembered! Once upon a time I saw a great idea for craft rooms- you know those small, random items you have? like that one perfect feather, or a small batch of buttons (I know, I've got a million, but some crafters sadly only have a few). Well, they took and put up small nails all in a row on the wall, then hooked up some clippers to it. (like those metal things with the black plastic, you can flip up the metal and use it to open the plastic part, then clamp onto something? does that make sense?) anyway, they put their small random items into tiny zipper plastic bags, like the ones you get beads in, and then just clipped them with the clipper things and hung them on the nails. All you need is a dose of grace and mercy for yourself. Do you know how many of us have spots that look like that? If you weren't busy and creative and productive it might not look like it does, but where's the fun in that? It sounds like you have reached the I-can't-live-with-it-any-longer stage and you will get it under control. Please don't feel bad about it--you are in the company of many wonderful women. hold on. what? #6 plastic containers can be made into shrinky dinks??? when did this become common knowledge, and where was I? wow. I'll be googling that today! as for the organization... hm. my craft room is also a mess, so I can't offer words of "well, what I do is..." but my mother (of course) has a beautiful sewing room that is perfect. unless of course she is in the middle of 5 projects... but then right when she's done with them her room is nice again. basically she just bought these two huge cabinets from a local tool store (like Lowe's, but not a large chain store). They were display models and she bought them uber cheap. then she went to the dollar tree (where everything actually IS a dollar, unlike other dollar chains) and bought a bunch of random plastic bins. She did not take the lids- left them right there at the store- when the lady asked she said "no, I don't need them" the lady probably thought she was nuts! anyway, she folded up all her fabric and sorted it into colorways. now she's got large amounts of purples stacked nicely on one shelf with a plastic bin holding smaller bits of purples. same thing for other colors. some have their own shelf, some share with a color friend- depending on how much she had of each. I've found that using boxes without lids can be helpful, but hard to store if you want to stack. Of course, I do more than sew- I stamp and crochet and papercraft and bead and mess with polymer clay and, and, and. so my room looks more like yours! but the box system does help some. some things just seem to resist having a home- ya know? 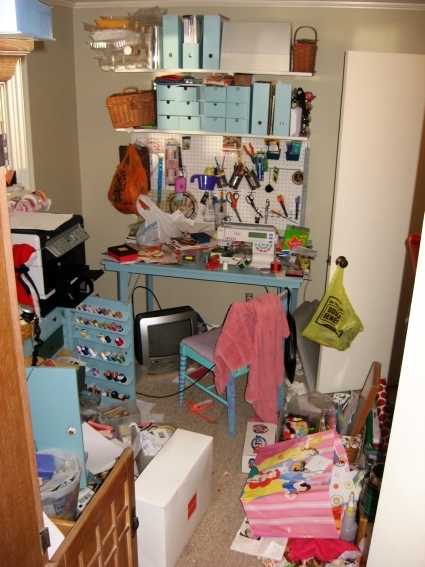 I think you've made a lot of people feel much better about the status of their craft/sewing/whatever room! I like using baskets and bins, or at least that's my plan! Love this post - your best ever!!! I for one am not offering to help - but you're right: You need some help!!! Pity my whole house is like this - all behind closet doors of course! I can't wait to watch the monthly pictures! I'm glad that I'm not the only one with a hovel. My office is such a mess and has been for so long, that I've ceased to be embarrassed by it. Sad, but true. I do want to clean it up in the New Year though. It's even starting to bother me. It's really hard to be motivated to clean a room where I can shut the door and pretend it doesn't exist when guests arrive. I really like the idea of posting a picture of the room at the beginning of every month. I'm not sure if I have the chutzpah to post a picture on my blog though, but maybe I'll at least take one. I am a teacher and supposed to teach other people's kids how to get organized, but my dark secret is that I coudn't even bring back my library book in time ONCE. So I went over to the FLY Lady just 2 minutes ago to register myself. You have been my inspiration for doing this. Maybe we can get organized together? You just made me feel so much better about wreckage from my holiday sewing! Thanks for keeping it real! Last time I cleaned my craft area it was out of sheer necessity...I had made such a mess that I couldn't find my tools for my project! I stopped crafting right then and there and cleaned until I found my tools I needed. If you need to get rid of anything send it my way! Hi - first of all you need to have a shrinky-dink making party/playdate, call up some like minded friends/kids and craft away. You will feel accomplished because you used something in your stash and it will be a fun kick-off. do it next week, don't delay! Get a gift wrapping organizer/station, it doesn't have to be purchased, but there are great ones for sale this time of year. - add a shoe box inside for bows, tape, scissors. Everything will be in one place when you need it. I actually keep my wrapping stuff under the bed in the guest room- not in the craft room - in a long box with wheels, the large rolls fit there plus tissue, bags, adornments, etc. Next to that is another long box with small stock up gifts - hostess, kids party, etc. When a craft is done ready to give, put it there. Get a big cardboard box for anything in your room that is recyclable, I'm not saying you are going to get rid of it, it is a craft supply category. or you could call it the kids craft box. This is the box in my craft room that my kids know they can use anything in it, interesting shaped boxes, egg cartons, yogurt containers with lids, tin boxes, foil, soda bottles, etc. Mine also has things I've decided I'm not going to use, paper I no longer like, pieces of string, feathers, scraps of fabric, their construction paper. They love digging through and finding treasures to make. There's a couple to start.. Best wishes, you can definitely do this, you have a great set up, good bones, so to speak, shelves, containers, it's just about re-arranging. And don't feel like you should throw anything away, I'm sure you might have some interested readers for supply give-aways or trades. I don't have any advice. My craft cupboard and shelves look a lot like that! Then there is the floor by my bed - so embarassing! Thanks for "keeping it real." My craft area is a corner of my bedroom and sadly my entire room looks just like yours! Thanks for this post, I don't feel like the only messy crafter anymore, YEA!! Oh, and could you do a blog post (or simply contact me) about this #6 container for Shrinky Dinks??? I always thought shrinky dinks came in a kit that you buy, didn't ever know you could do them yourself. I've always wanted to do them with my girls but have never found the kits (always forget to look when I make it to a craft store). I really don't know who's craft room is organized! If anyone has an organized one they couldn't possibly use it much. Every single year I am in the same boat though and find if I go through every little thing in my craft room I will find things I have not used since I collected it or things that just don't appeal to me anymore. I box it all up and give it to the local community center. As I'm going though everything I am able to group things together better and find that once everything is in piles I have more inspiration and ideas on what to do with those piles with what I have. And yes, I set aside a couple of days and I force myself not to craft during those days! The only way I have found to do it is by stripping away what I DON'T need to make nice, tidy room for what I DO need. Maybe this sounds too simplistic and like I'm stating the obvious root of the problem -- but here's a little example. If you were to take those #6 containers and slice away the un-usable, rippled sides, you'd be left with just some flat sheets of plastic. Those could be placed in a container or even a manila folder or envelope to await projects. Then, the rest could be tossed. Bulky packaging, plastic bags, and the like will only lead to frustration. Consolidate to only what you'll need. I also scrutinize everything to decide if it is a tool or a supply. That is, is this something I'll use more than once? Or is it a consumable like fabric or wood? Then, I store tools for like-projects together, and supplies together. Label, label, label. My other tip is to use clear, see-through organization supplies as often as possible (with, yes, tons of labels). So, I use clear zipper bags, clear plastic bins, etc. I also tend to organize things by color rather than type, since I'm much more likely to be searching for just the right PINK ribbon than just the right 1/4" ribbon. So, in a bin labeled "ribbon" I'll have a zipper bag full of pink ribbons, red ribbons, etc. That's just the way I work, but it makes the clear bins look really pretty. The clear bins help me because I am such a visual person. It helps me feel surrounded by my projects, rather than cut off from them. It helps me monitor when things are empty. It helps me not be so reliant on labels (but still use them!). Anyway, just some preliminary thoughts. Love your blog. First-time commenter. Oh my. I know you can do it, and I also know how EASILY a craft room becomes messy, so I don't judge. However, the one thing I have noticed is that I am much more productive with a clutter free room....so I wish you luck and I know you can do it!! Ahhh, a craft room....how I wish I had one! And I wish I could show you my husband's home office - it would make you feel really good. (and he would have a fit if i organized it for him, sigh..) Anyway- first thing I'd do is go through with a trash bag and clear away anything I'm not gonna use. Be brutal!! The next thing that jumps out at me is the pile of shrinky dink plastic- cut off the bottom/top part that you'll actually want to use and throw the rest away. That would give you a much smaller and more manageable pile. That's the first thing that jumps out at me, anyway. How about "trading spaces" --- my attic for your craft room? It's much easier to throw away the other person's stuff! Actually, that's not a fair trade -- 1/4 my attic for your room would be more like it! Does that make you feel better? We all have our secrets!! In spite of that room, you still inspire us all to make things more beautiful, tastier and more creative, while raising 3 of the best kids ever! Keep up the good work! love you! ooh, i love you even more now!!! i too have longed for a "martha" craft room. when i finally got a room-- it has been anything but "martha" especially since the busy christmas season. i've been having my creative itch again, but have no desire to walk into that messy room. i'm just going to have to break down. i can't wait to see pics of your progress. hopefully they'll inspire me. That acutally just made me feel better. What's sad is I took over the middle childs room because he was sharing with the older anyway and now he wants his own room again, well just his own bed. He's 3! So, I've got figure out where to put all my stuff or remodel! Oh dear, I can't tell you how relieved I am to find out I am not the only one whose sewing area got into trouble just so she could finish Christmas projects. Actually, that's not true. My sewing place is always in a mess. All year. Also I never have enough storage place because I have no discipline when I go shopping. I tried to tidy it up the past few days when the husband was home to co-babysit but ended up sewing donuts instead and adding to the chaos. But a few times a year that area is actually organized and I will tell you my secret: it's when the in-laws are visiting. Very motivational. Thank you for your wonderful blog - it's one of my very favorites because your creativity is so multifaceted and your projects so diverse and fun to do. More in 2009! More! Have a great new year! I love the turquoise blue furniture and accessories! You've had some pretty good advice already. The only thing that I would add is that you shouldn't be afraid to throw things out. Be realistic with yourself and get rid of the things that you are not going to ever need or even half finished projects that you are not going to finish. I love that you kept it real...my "space" looks just like yours! Thanks for sharing and making me feel normal. I pick at the mess here and there and sometimes can make it look somewhat presentable. But when I'm creating and in the moment, the last thing I can think about is organization! My room is also less than perfect. 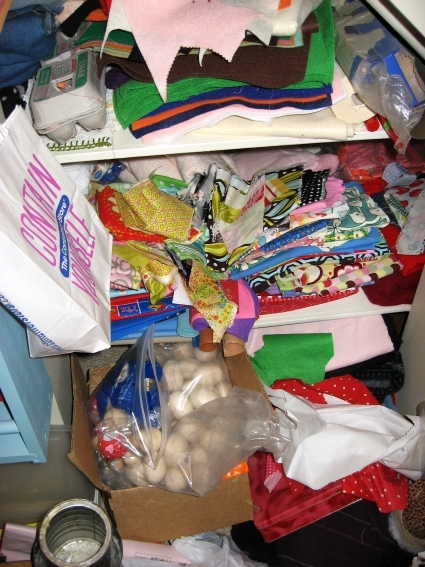 My goal in general for 2009 is to organize my life and my house - including my sewing room. And I have a large space so my excuse is my kids keep making it a mess. Storage. I want nice storage that won't cost me an arm and a leg. I second, or third the flylady comments! Check her out at www.flylady.net I think you actually have a great space there and once you dig into it, it won't be as bad as you think. I have your room's twin in my house. I am doing a few minutes everyday to sort and organize. I am giving myself months to get it in order. Less stress than a certain date or month. I will work on it....albeit slowly. you know there are home organization shows on hgtv that come do a show about people like you, they completely make over rooms and make it more functional, and give you lots of advice. you should figure out how to apply and see what you can do that way. they might like to have someone like you. I see lots of treasures to be found! What a fun (if a little unruly) room! I see you've got a Pfaff! My parents (recently in the process of retiring) have had a sewing business for 40 years, and were Pfaff dealers! I'll look forward to your monthly photo updates!! Thanks for showing pictures! All I can say is label, label, label! I forgot to say............... I made the crayon rolls for my granddaughters and my daughter told me it was her favorite thing that the girls got from anyone. They turned out really cute. I feel your pain. I'm one of the most unorganized people on earth and my craft room shows it the most...ok well so does my bedroom, kitchen...nevermind! I thought I had it figured out with shelving and storage containers but that just seems to make it hard to find what I need. I can't wait to see what you come up with! If I think of anything I'll pass it on. Good Luck and again I love your blog, your creativity is awesome! It really looks like you have a lot of great components for organization. I guess I would say do it the Fly Lady way and just take 15 minutes a day...no more...and tackle it just nibbles at a time. AND then when it's all done use that 15 minutes a day to keep it that way. My sewing area is in my husband's office so my motivation is constant...he always lets me know if it's getting bad. best of luck to you this year! That looks like a big job, but I'm sure you'll do fine if you just keep at it! p.s., I used to have that same stack of #6 plastic containers for shrinky dinks that I never did make. I think you need to start with a big white trash bag. You might feel better by just throwing stuff away - but not anything you might need :-}. Have you ever read "The Fly Lady"? Great stuff, easy to start and easy to pick up again once you have dropped the ball (aka holidays). You are brave, see I won't post mine until its clean...see you can see the carpet in yours whereas mmm...can not in mine! But I have a deadline to get it cleaned (when I go back to work/school next Monday) Best of luck in your quest! My craft closet looks just like your room. I just wish I had a whole room. I say I would be much more organized if I had more room but we all no that's a lie. I am working on simplifying in the year 2009. So hang in there. Love your blog and have found many projects here to keep me unorganized. Keep up the good work.